"Saying Goodbye Too Teal, A Sad Day Here In The Northern Forest!" It is a sad day here with the unexpected passing of Teal! She showed no signs of illness and passed away this morning after the morning watering and before today's run. There is a testimonial to her on the "Reflections Page". 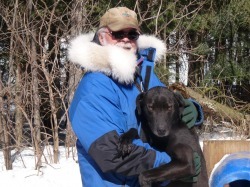 She was the sweetheart of the kennel and a great Sled Dog. Teal will be sorely missed. Here is a video of her last run, Teal is on left Wheel.